Despite the Adirondacks’ northern location and cool climate, nine snake species live in the area. While most snakes of the Adirondacks are completely harmless to people, one species -- the timber rattlesnake (Crotalus horridus) -- does inhabit these mountains. Though they reach only about 36 inches in length, Eastern milk snakes (Lampropeltis triangulum triangulum) are the largest nonvenomous, terrestrial snake in the Adirondacks. Milk snakes are the only constrictors that live in the Adirondacks. Milk snakes hunt a broad range of prey, including rodents, lizards and snakes. Milk snakes primarily live in forests, but they adapt well to human presence. Milk snakes search barns for rodents so commonly that early settlers thought that they must be drinking milk from the cows – which is why they are called milk snakes. Northern water snakes (Nerodia sipedon sipedon) are an adaptable species that can thrive near ponds, lakes, streams, creeks and man-made canals. Their diet is very broad, but frogs and fish are their principle prey. Northern water snakes exhibit sexual dimorphism; females grow much larger than males do. Northern water snakes are often irritable; they usually attempt to flee when threatened, but they will musk, bite and flatten their bodies when cornered. Northern water snakes give birth to fully formed young in the late summer or early autumn. Garter (Thamnophis sirtalis) and ribbon snakes (Thamnophis sauritus) are similar species. Both are clad in longitudinal stripes, though garter snakes often exhibit checkerboard patterns between the stripes. They hunt for similar food, including frogs, salamanders, worms, snakes and rodents. 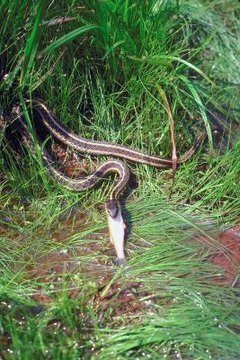 They both frequent aquatic and semiaquatic habitats, though the garter snake can tolerate living farther from water. Brown (Storeria dekayi) and red-bellied snakes (S. occipitomaculata) live in the Adirondacks and the surrounding region. They are alike in size, diet and habitat preference; the biggest difference in the two is their coloration. Though both vary widely from one individual to the next, red-bellied snakes are darker than brown snakes and have a red ventral surface. Both species spend their lives hunting under objects and through the leaf litter for slugs and worms. People most often encounter these snakes when lifting debris in their yard or garden. Smooth green snakes (Opheodrys vernalis) consume insects, spiders and other invertebrates. Well camouflaged in the grass or low branches of shrubs and trees, these snakes are usually inoffensive when picked up. Northern ringneck snakes (Diadophis punctatus) are small snakes that live in the leaf litter, under logs and debris or inside rotted tree stumps. They use enlarged fangs in the rear of their mouths and weak venom to subdue their worm, salamander or snake prey. Ringneck snakes may musk or bite if handled, but most experts classify them as harmless. Timber rattlesnakes are the only species of dangerously venomous snake living in the Adirondacks. Reaching 5 feet in length, these rattlesnakes prey on squirrels, chipmunks and rabbits. Timber rattlesnakes usually attempt to ambush prey, but they will also forage actively. They use their rattle to deter potential predators. Though you should keep your distance from these snakes, they will not instigate an encounter unless they feel threatened or cornered.